Famous lead guitarist Jimmy Page from the legendary rock band Led Zepplin was known for his tremendous electric guitar solos. Now you can bid and possibly win one of two Jimmy Page replica guitars! 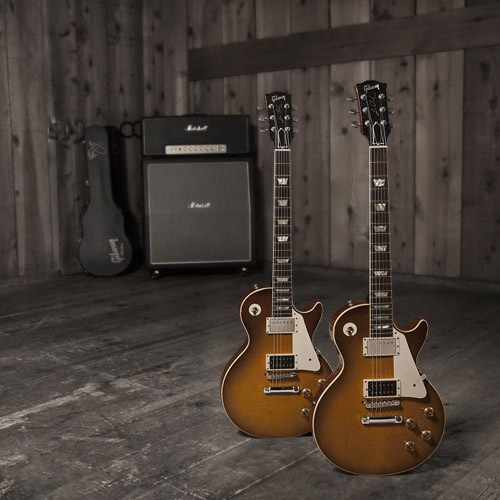 These two high end, collectible Jimmy Page guitars are replicas of his awesome Gibson, 1959 Les Paul. Jimmy Page began using the Les Paul in the 1970’s and he named it “Number Two.” Gibson Custom recreated only 25 limited edition, “Number Two” guitars about four years ago with Page’s personal signature. 325 total were produced. 100 were aged by vintage-reproduction master Tom Murphy, plus 200 were finished to match Gibson’s VOS specs. The guitar replicas are so spot on that even the unique wear of the Page’s original guitar through decades of use were mirrored. There are wear marks, dents and even minor dings. Page himself owns guitar #1 himself. The two, limited-edition guitars are both individually numbered, personally signed and even played by Jimmy Page. The minimum auction bid starts at $20,000. The winners also receive a certificate of authenticity. Guitar Center is the world’s largest retailer of guitars, amplifiers, drums, keyboards, recording, live sound, DJ and lighting equipment. 2014 is a major milestone year for Guitar Center. It’s the company’s 50th anniversary and continue their ongoing tradition of helping people make music. Jimmy Page originally had the electronics of his “Number Two” guitar modified to try and achieve the widest possible range of sounds from two humbucker pickups. Page even tried to match his “Number One” Les Paul by having the iconic guitar’s neck shaved down. The Custom Shop replica of the Jimmy Page “Number Two” Les Paul, is made with the finest material such as Grover tuners, stopbar tailpiece and the period-correct “antique bell” truss rod cover. Each of the guitar’s controls’ potentiometers was replaced with a push-pull pot to allow individual pickup of switching functions. If you are an avid collector, contact The Life of Luxury and we can help you locate that desired item. If you enjoy reading great stories like the Jimmy Page replica Gibson, Les Paul Guitar, follow this luxury blog.